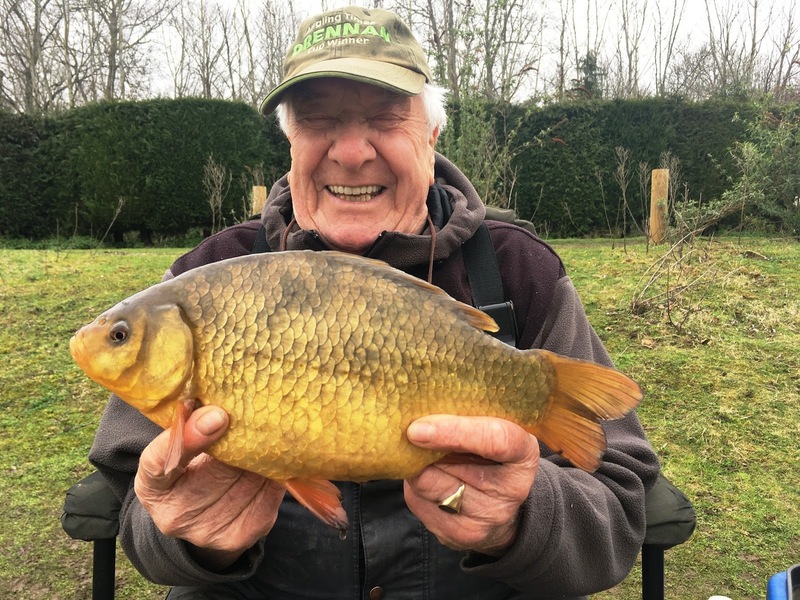 Duncan Charmans World of Angling: Harris Lake is fishing its nuts off! Harris Lake is fishing its nuts off! The weekend before last I had arranged to meet my father at GAS Johnson's Lake but word had got out about the odd big crucian being caught and it seemed the world had descended onto its banks. There were the odd swim free, however this would have been in the teeth of a chilly north wind, one I wouldn't have minded, but dad at 86 probably would have found this somewhat uncomfortable so we decided to see how Harris Lake was fishing? Once again all the favoured swims were taken so we dropped into pegs 26 and 27, an area I rarely fish but with the wind blowing down this end I wasn't that bothered. Dad fished a flat-bed feeder whilst I stayed with the Pellet Cone, both of which contained 2mm Nash pellets in their own way. Plastic maggot on one rod and corn on the other, both soaked in Nash Scopex No 1 flavour were cast tight to the island before we sat back. We had already said that half a dozen fish by dusk would be good, a target based on how hard neighboring Jonhsons was fishing, so when my alarm sounded ten minutes in I was quite surprised. Corn seemed the best bait however with ten tench in less than two hours, Dad was somewhat struggling having lost just one fish. I had been constantly helping him to try and get his rods working but it seemed that my swim contained fish, whilst his didn't. I then took a walk over to Johnsons and when I returned he was into his third fish, this time a crucian around 3lb! Whilst Dads swim came alive mine died and four hours later I could only add four more tench whilst dad another eleven, mostly tench but also another big crucian. If you want an introduction to getting to grips with the Pellet Cone, flat-bed feeder, helicopter rig or groundbait lead, all brilliant tactics on Harris then I am available for one-to-one, or if you have a mate, group guiding days, just email me at duncancharman@me.com for prices, details and availability. A change in the way I bring 'My world of Angling' to you. I have decided to go back to my old style of bring news to you, so the monthly blog will stop and in future every session will be shown here in a short session round-up. This is because I want to let you know of things as they happen so expect more frequent posts.